When you or your employees are traveling for business, the trip itself may seem like the least of your concerns. There are prospects to impress, presentations to perfect, relationships to build, and deals to close. But none of that will get done if the trip goes awry. Using a travel safety action plan for every trip, and ensuring every one of your travelers learns and observes some basic practices, can help avert these unpleasant surprises and allow everyone to focus on the business at hand. Make these travel safety habits part of the plan can help keep you, your employees, and the interests of your company safe while traveling for business. The minute plane tickets are purchased, don’t forget to start planning all non-airplane travel. Spend five minutes figuring out how you’re getting to the airport, from the destination airport to the hotel and back again. Schedule your departure ride the day before your trip to make sure you’re on time. Even more important, figure out what your transportation options will be when you land. This is especially critical to handle ahead of time when you’re headed to a new city or country. Are there shuttles to your hotel? What’s the taxi situation like at the airport? If a rideshare app like Uber is available, you can request your ride when the luggage carousel finally finishes spitting out your bags. At every airport, you’ll find many different transport options like shuttles, cabs, buses, and trains. In certain cities, there might be some temptingly cheap and seemingly convenient transport options like unlicensed cabs, vanpools, and off-duty limos lurking on the outskirts of the airport. While it sounds awesome to roll up to your hotel in a stretch limo, don’t succumb to the temptation of taking a sketchy ride. There’s no guarantee of how safe it will be, how much it will cost, or if you’ll even be able to expense it when you get back. And while you’ll probably be fine on public transport, the last mile to the hotel could end up being a pain. Using a trusted ride request app with a strong reputation and an international presence is your best bet to arrive safely and on time. If you’re flying to Detroit for a conference and you’ve been there a million times, you can get on the plane, and take it easy. But if you’re traveling to a city or country that you’ve never been to before, doing a little homework on the area could make the trip go a lot smoother. Look for restaurants near the hotel, study local customs, and get up to speed on the nuances of local business practices. Especially when traveling overseas, duty of care obliges you to assess the potential risks of the trip and to make sure employees are aware issues like terrorism and social unrest. In the United States, you can check for travel advisories at travel.state.gov. The State Department advises that conditions can change rapidly, so if there is any doubt about the safety or stability of the destination, check again just before departing. If your phone has been acting wonky, has a busted screen, or won’t hold a charge, replace it before you travel. You don’t want to end up stranded or late for a meeting because your phone decides to die when you land in Munich. And if your company uses multi-factor authorized logins or SMS token codes, a dead phone can be disastrous. If your device is in good shape, take extra precautions to make sure it stays that way. Use a good case and screen protector to protect your phone if it takes a tumble while you’re on the road. While international power adapters are good to have, bringing a quality (and fully charged) battery bank along with an extra cable helps assure that you’ll be charged up no matter where you are. In a 2017 Business Travel Show survey, 46 percent of businesses stated that health and travel security incidents impacted business continuity in 2016. Especially when traveling alone or to unfamiliar countries, it’s important to use apps that allow coworkers and family to find your location. If the worst happens (or you just get a little lost) making yourself easy to find will make for a much better outcome. Location sharing in apps like Uber can also make coordinating with fellow travelers easier. When you request a ride using the Uber app, you can easily share your location with colleagues so they know where you’re headed and when you’ll get there. This is especially handy when you’re unfamiliar with your surroundings. And for travel managers, the enhanced features also available with Uber for Business through its integration with International SOS, giving your organization access to important location and safety information in order to take action in critical situations. Your phone, laptop, tablet and other devices should be locked down with an appropriate pin, password, or biometric lock at all times. Always log off when you’re done working. According to Infosecurity Magazine, 87% of employees surveyed have lost a USB drive and failed to notify their company. Cloud storage (preferably employer-provided) is far more secure and you can’t lose it. Public Wi-Fi doesn’t protect your web activity and data like your office network can—it’s like working on a top-secret project in a glass-walled room. Use your phone as a Wi-Fi hotspot or get a portable hotspot from your employer. If you’re going overseas, make sure you have all the appropriate vaccinations and that you’re healthy enough to travel. Check if your health insurance provides coverage at the destination, make sure that all employees are covered by appropriate travel insurance, and see that everyone knows how to access emergency medical care where they are traveling. All travelers should carry a card with company contact details and emergency numbers so they can get help quickly in an emergency. Getting home can suddenly become quite difficult if you lose your ID. Keep your passport and ID on you at all times and carry backup identification in your luggage. Identification can also be scanned and uploaded to the cloud as a last-resort backup. While you might never be able to prevent any health or travel security incident from ever occurring, it is still helpful to have a business travel plan. By making these business travel safety habits part of your travel policy, you can help travelers avoid common pitfalls and better protect the interests of your business. 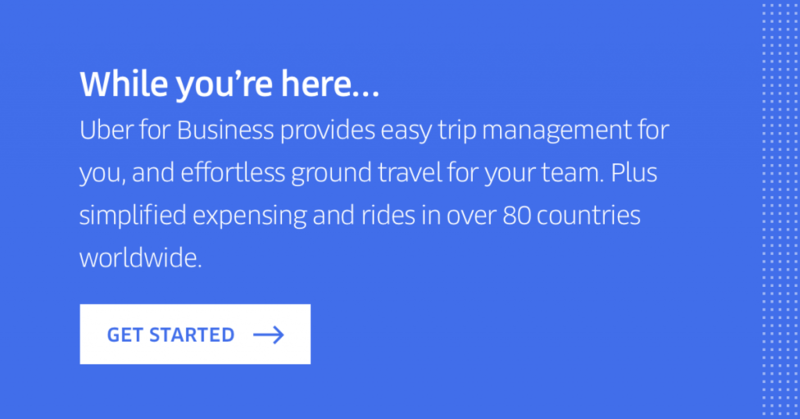 Uber for Business helps simplify work travel plans and offers a reliable way of getting to the next meeting in over 80 countries, including effortless expensing, trip-level visibility, and more. Sign up today.